If you are seeking legendary adventure action, unique experience to fill your travel diaries, exquisite luscious foods, gaze at miraculous natural wonders, and ancient historical sights – then Vietnam is the place for you. The country is home to Phong Nha Ke Bang national park. This is not your usual national parks, it’s different with caves all around and has the biggest cave in the world, the Son Doong Cave. 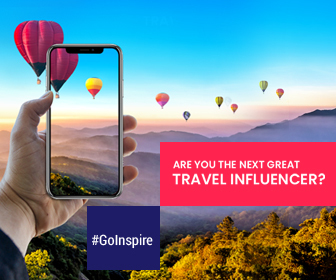 This is like a world in itself with mountains, lakes, jungles, extremely exotic and endemic wildlife, and own clouds as well, this place has it all. This is a 3 million year old cave that has a phenomenal magnificence, a mystical appearance, scary sounds, and not to forget the enormous size. The tours are limited to 450 visitors per year to support and create a sustainable future for the vast caverns and plant-life. It's so big that it has its own jungle, its own river and its own clouds. Song Doong means Mountain River in Vietnamese and the history goes like this of its discovery. A local farmer, Ho Khanh discovered this in 1990 when he was seeking shelter from a passing storm in the jungle. He saw clouds and the sound of an underground river coming from a large hole in the limestone. He reported all this to the British Caving Research Association (BCRA), who were in Phong Nha at the time. However, he lost the way and forgot the exact location and the cave remain undiscovered for the next 18 years. Again in 2008, Ho Khanh again while hunting for food stumbled across the entrance, and this time he returned with Howard and Deb Limbert from the BCRA. Since 2008, the exploration has started but still many part of the cave remain untouched and a secret to outsiders. The cave is more than 5 kms long and reaches heights of 650 feet at few points. In 2013, the cave expedition was opened to the public for the first time. The tour operator assigned for Song Doong is Oxalis. This was a planned move by Vietnam Tourism to give rights to one tour operator only to maintain the serenity and protect the cave. 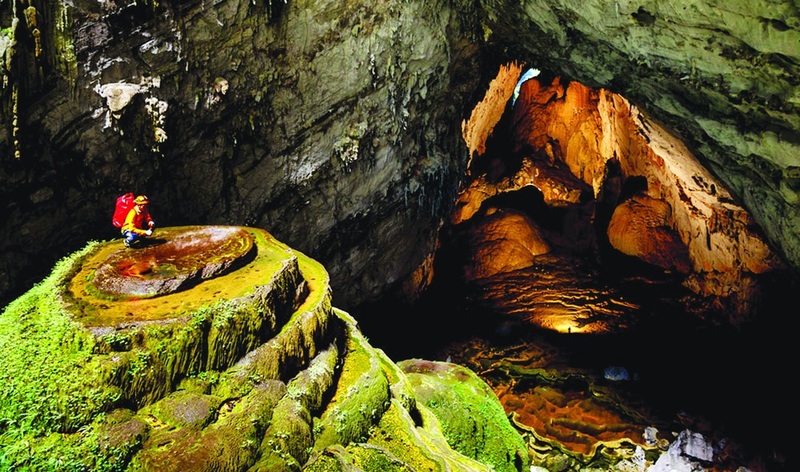 The journey to Hang Son Doong is for adventure lover. It has 2 days of intense jungle trekking and river crossings to reach the entrance. The nights have to be spent inside the cave. If you wish to see the end of cave, you have to abseil, climb, crawl and swim through underground rivers to arrive at the end of the cave. Oxalis arranges for two caving experts, three local guides, two chefs, two park rangers and 20 porters to accompany tourists on every expedition. The caves existence was not displayed on Google Earth till 2009. The eco-system inside Hang Son Doong is unique and has its own localized weather system. Rare limestone cave pearls are scattered in dried pools. The largest stalagmite ever found stands 80 meters (262 feet) tall. Collapsed ceilings have created openings known as dolines, allowing foliage to grow inside the cave. A cavern can accommodate an entire block of a New York street. The cave can accommodate up to 68 Boeing 777 airplanes. 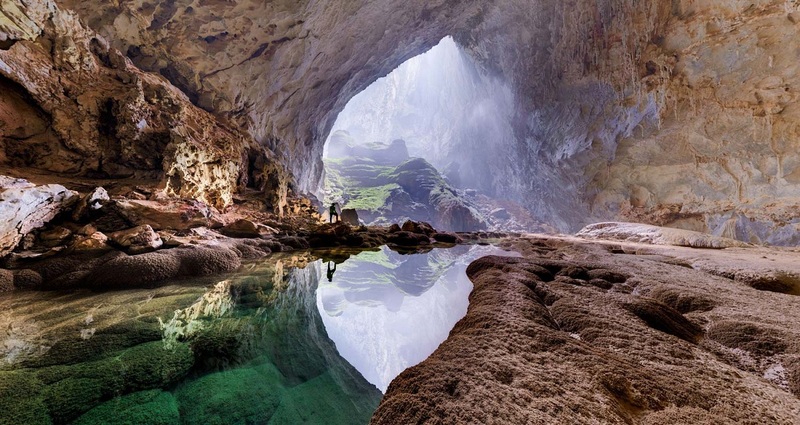 Son Doong cave is located in Phong Nha Ke Bang national park. 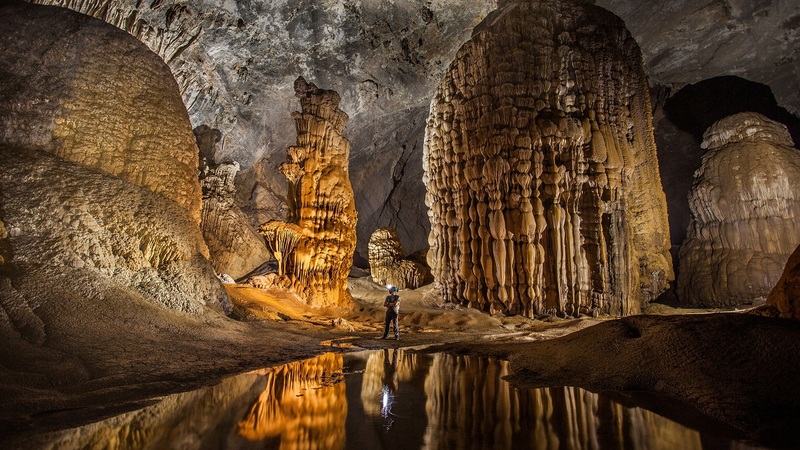 Listed as a Unesco World Heritage site, Phong Nha Ke Bang National Park is an heaven for visitors who are hungry for adventure. 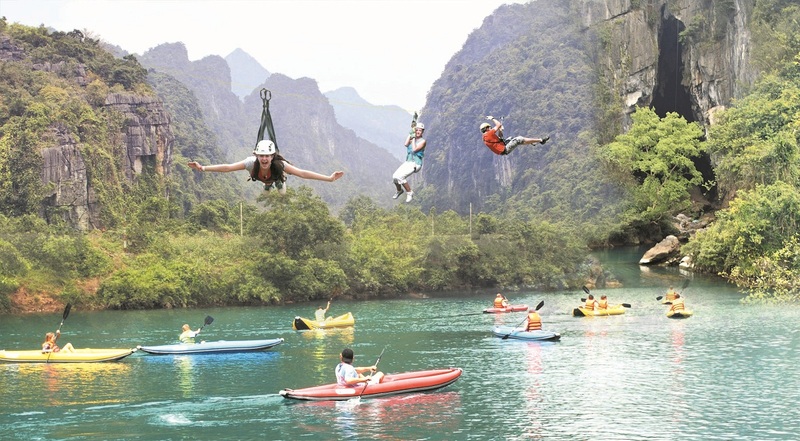 Being a new tourist destination, reaching Phong Nha requires a little planning. There is an airport at Dong Hoi – the nearest urban area. There are connecting flights to/from Hanoi, Chiang Mai, and Guangzhou. Vietnam Airlines, VietJet Air, Korean Air, Emirates, Singapore Airles, & JetStar have flights to Dong Hoi. Once you Dong Hoi, you have buses, private taxis, motorbike taxis to take you to Phong Nha. You can stay at one of the many hotels in Dong Hoi. There are budget hostels, apartments, and hotels to choose from. If you wish to stay Phong Nha, choose from the many guest houses in the national park. Choose cash over credit card since there is just 1 ATM in the town. Have change enough for necessary things. It’s all about hiking, trekking, and exploring caves and jungles at Phong Nha, so pack clothes and footwear to cover your skin from bugs or insects. The place witnesses floods usually from mid-September until mid-November every year. The best time is Feb to August. The market in Phong Nha are opened from 6-11AM and then 2-6PM. It’s the best place to find hats, socks, flip-flops, raincoats, snacks, etc but not proper trekking gear and clothing. You can rent bicycles and motorcycles for rent for free at few guesthouses. Check with the hotel reception.